In case you haven't noticed, Tastykakes are everywhere in Philadelphia. They sponsor Flyers goals, they get flung over the Eastern State Penitentiary walls on Bastille Day, and they make appearances at Philly-themed corporate lunches all over the region. Tastykakes have also made their way onto the menus at several Philadelphia restaurants in one way or another. Here's where to find them. Foodspotting and the Greater Philadelphia Tourism Marketing Corporation (GPTMC) hosted a Foodspotting "Eat Up" recently so those among us who regularly broadcast photos of our food across the Internet could try some of these treats. It was essentially a three-course dessert for dinner, but hey that's what all the Broad Street training was for anyway, right? We made three stops on the tour. 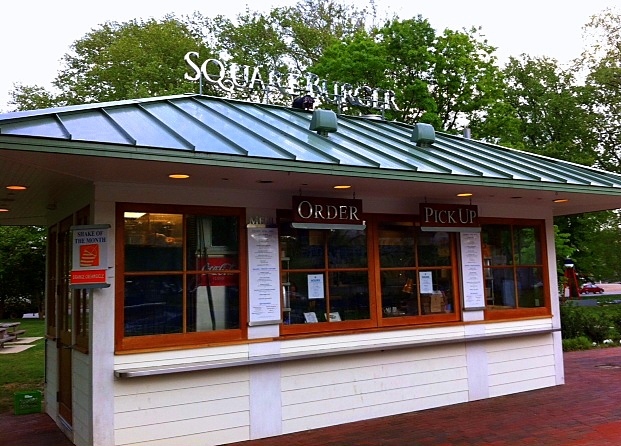 First up, Square Burger in Franklin Square, the park sort of behind the Constitution Center that was refurbished a few years ago with a carousel, Philly-themed mini golf course, and lots of green space. Stephen Starr opened the walk-up burger n' shake spot there a few years ago. One of its signature items is the Cake Shake, made with a Tastykake Butterscotch Krimpet, vanilla ice cream, and caramel sauce drizzled on the sides. It was quite a light and delicious treat, not overly sweet or butterscotchy. 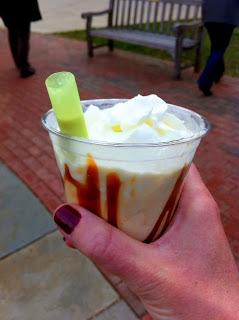 It also comes with a wide, squatty straw/spoon for easy consumption by kids or adults. Regularly $4.50. Next up was 10 Arts in the Ritz Carlton Hotel. There, the pasty chefs make their own ice cream and cones, including one flavor with Tastykake's peanut butter and chocolate Kandy Kakes (my favorite). The ice cream was certainly good, as I tend to like anything with pb & chocolate, but I wouldn't say it's one to go out of your way for. Still, a nice thing to do with local "ingredients" if you could call it that. 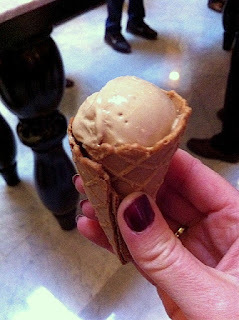 A selection of ice creams at 10 Arts is $10 during dinner. Last stop was the new Square Peg restaurant at 10th and Walnut. We just wrote about the restaurant and its Tastykake treat, another shake but this time "for adults only." 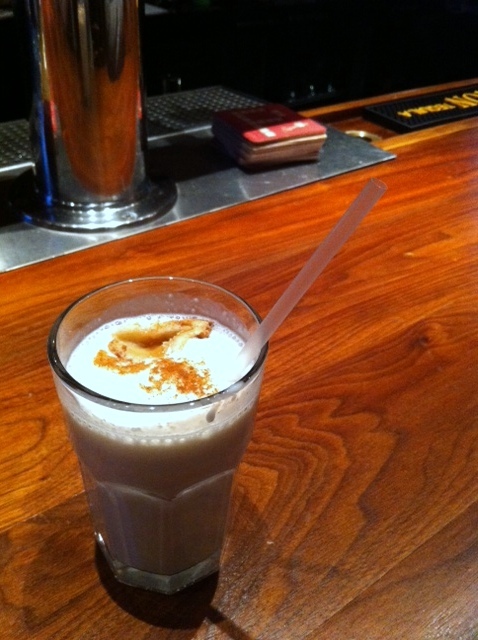 Square Peg has a handful of spiked shakes on the menu, including this Apple Pie Shake with Jim Bean, White Tail Caramel Whiskey, Apple Pie Tastykake and Apple Vodka, topped with cinnamon and hunk of pie crust. 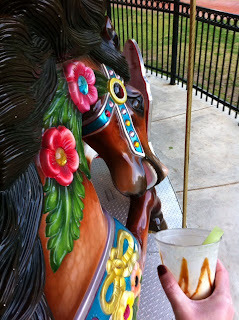 The $9 drink definitely tasted like a liquefied slice of apple pie, plus vodka. Maybe a little too much vodka. Anyhow, could be a fun alternative to dessert at an overall fun restaurant, or something different to cool you down/pick you up instead of regular ice cream this summer. (see our last post for more on Square Peg's food) Update: Square Peg closed in June 2013. You aren't missing much on the shakes. There is an official guide for Tastykake-inspired dishes on Foodspotting for you to follow along and then post your own pictures. Supposedly Philadelphia Bar & Restaurant makes a Tastykake bread pudding, too, which sounds amazing. Are there other Tasty-inspired dishes out there missing from the list? ?